Not to be confused with GLBTQ Legal Advocates & Defenders. Formed in New York City in 1985 to protest against what it saw as the New York Post's defamatory and sensationalized AIDS coverage, GLAAD put pressure on media organizations to end what it saw as homophobic reporting. Initial meetings were held in the homes of several New York City activists as well as after-hours at the New York State Council on the Arts. The founding group included film scholar Vito Russo; Gregory Kolovakos, then on the staff of the NYS Arts Council and who later became the first executive director; Darryl Yates Rist; Allen Barnett; and Jewelle Gomez, the organization's first treasurer. Some members of GLAAD went on to become the early members of ACT UP. In 1987, after a meeting with GLAAD, The New York Times changed its editorial policy to use the word "gay" instead of harsher terms referring to homosexuality. GLAAD advocated that the Associated Press and other television and print news sources follow. GLAAD's influence soon spread to Los Angeles, where organizers began working with the entertainment industry to change the way LGBT people were portrayed on screen. Entertainment Weekly has named GLAAD as one of Hollywood's most powerful entities, and the Los Angeles Times described GLAAD as "possibly one of the most successful organizations lobbying the media for inclusion". Within the first five years of its founding in New York as the Gay and Lesbian Anti-Defamation League (soon after changed to "Gay & Lesbian Alliance Against Defamation" after legal pressure by the Anti-Defamation League), GLAAD chapters had been established in Los Angeles and other cities, with the LA chapter becoming particularly influential due to its proximity to the California entertainment industry. GLAAD/NY and GLAAD/LA would eventually vote to merge in 1994, with other city chapters joining soon afterward; however, the chapters continue to exist, with the ceremonies of the GLAAD Media Awards being divided each year into three ceremonies held in New York City, Los Angeles and San Francisco. Following the 2011 resignation of Jarrett Barrios from the GLAAD presidency, Mike Thompson served as interim president until the announcement of Herndon Graddick, previously GLAAD's Vice-President of Programs and Communications, to the presidency on April 15, 2012. Graddick is the younger son of Charles Graddick of Mobile, a circuit court judge and the former Attorney General of Alabama. In 2013, Jennifer Finney Boylan was chosen as the first openly transgender co-chair of GLAAD's National Board of Directors. On March 24, 2013, GLAAD announced that it had formally dropped the "Gay & Lesbian Alliance Against Defamation" from their name and would now be known only as GLAAD to reflect their work more accurately; the name change was a commitment to incorporate bisexual and transgender people in their efforts to support the LGBT community in its entirety. Sarah Kate Ellis is the current president and CEO of GLAAD. Ellis took reign in 2014 and under her leadership GLAAD's revenue grew by 38%. In 2015 Ellis hired Nick Adams as director of the transgender media program. 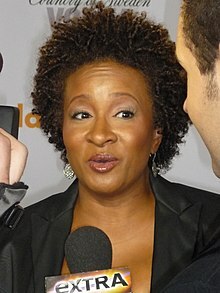 Comedian Wanda Sykes at the 2010 GLAAD Media Awards. The GLAAD Media Awards were established in 1989. Ceremonies are held annually in New York City, Los Angeles and San Francisco. Established in 2002, GLAAD's Announcing Equality project has resulted in more than 1,000 newspapers including gay and lesbian announcements alongside other wedding listings. In March 2012, GLAAD launched the Commentator Accountability Project, which seeks to index and document frequent contributors, guests and pundits who regularly express anti-LGBT bias and misinformation in their contributions to journalistic outlets. In August 2013, GLAAD launched its first annual Studio Responsibility Index, which indexes "the quantity, quality and diversity of images of LGBT people in films released by six major motion picture studios". The GLAAD Media Reference Guide is a style guide of recommendations for writers, especially journalistic outlets, to reference in positive, inclusive depiction of LGBT people. It has been published since the 1990s (then known as the GLAAD Media Guide to the Lesbian and Gay Community), with the 10th edition, being the most recent, published in 2016. GLAAD has begun the Together Movement, which encourages all to join in support of those discriminated against including women, Muslims, immigrants and members of the LGBTQ+ community. In 2010, GLAAD launched Spirit Day. Spirit Day is an annual national day of action to show LGBTQ youth that they are not alone because there is plenty of support all around them. In 2016, Spirit Day is the world's largest and most-visible anti-bullying campaign. The campaign works to bring anti-bullying resources to classrooms all around the world by inspiring educators to take action against bullying through hosting events and rallies. The campaign also created a GLAAD's Spirit Day kit for use in classrooms, which is available in 6 languages. On social media, people are encouraged to wear purple or go purple online in order to stand united against bullying. Huge media companies such as NBC Universal and Viacom show support for Spirit Day on the airwaves. They even change their on-air logo to purple for the day. They also enlist talent who wear purple during the day's broadcast. More than 1.5 billion media impressions annually are seen in support of the campaign. The hashtag #Spirit Day has become a trending topic on Twitter and Facebook every year. On social media, people such as Oprah Winfrey, Ellen DeGeneres and even President Barack Obama have shown their support for the campaign. ^ a b Peeples, Jase (March 24, 2013). "GLAAD Affirms Commitment To Trans and Bi People, Alters Name". The Advocate. Retrieved March 25, 2013. ^ "Barnett, Allen (1955–1991)". glbtq.com. Archived from the original on October 15, 2012. Retrieved March 25, 2013. ^ Reynolds, Daniel (2013-11-08). "GLAAD Appoints First Transgender Cochair". Advocate.com. Retrieved 2013-12-03. ^ a b Setoodeh, Ramin (Sep 27, 2016). "The woman who saved GLAAD: how Sarah Kate Ellis brought the faltering nonprofit into the 21st century". nn9yl5wf5d.search.serialssolutions.com. Retrieved 2017-10-10. ^ Reynolds, Daniel (November 25, 2013). "GLAAD Announces Sarah Kate Ellis as President". The Advocate. ^ "Announcing Equality". glaad.org. Retrieved March 25, 2013. ^ "Commentator Accountability Project (CAP)". GLAAD. Retrieved 2013-11-02. ^ Max Gouttebroze (August 21, 2013). "First annual Studio Responsibility Index finds lack of substantial LGBT characters in mainstream films". GLAAD. ^ ""GLAAD Publications", as archived on 5 February 1997". Web.archive.org. 1997-02-05. Archived from the original on 1997-02-05. Retrieved 2013-12-03. ^ "Media Reference Guide – 9th Edition". GLAAD. Retrieved 2015-08-04. ^ "Take the Together Pledge". GLAAD. 2017-01-31. Retrieved 2017-09-29. ^ a b c d e Adams, Seth (August 2016). "GLAAD hopes to stem bullying of LGBTQ youth on Spirit Day". nn9yl5wf5d.search.serialssolutions.com. Retrieved 2017-10-27. Myers, Daniel J.; Daniel M. Cress (2004). Authority in Contention. Emerald Group Publishing. ISBN 0-7623-1037-5.